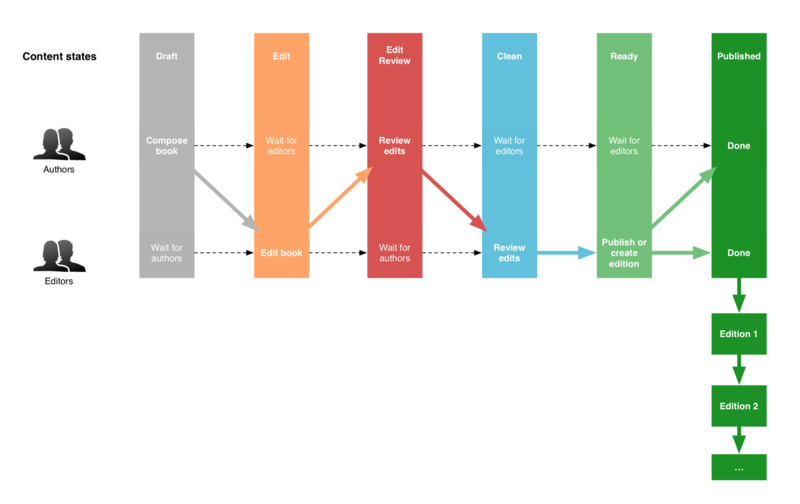 Scalar’s editorial workflow requires that the book’s content goes through six editorial states to be published. Draft. All content begins in the private Draft state, where Authors can add, remove, and edit content as they see fit. Edit. Once content is ready for editing, an Author moves it to the Edit state, where only Editors can make changes. Editors can edit page by page or use the scrolling Editorial Path view to quickly move through the book’s content and make edits or add queries. Edit Review. When editing is complete, an Editor moves the content to the Edit Review state, where Authors can review, accept, reject, and otherwise respond to changes and queries suggested by Editors. Clean. Once all changes are made, an Author moves the content to the Clean state for editorial sign-off. Ready. When an Editor decides that the content is ready to be published, they move it to to the Ready state. Published. Finally, when an Editor moves content to the Published state, it becomes publicly available. Future changes will go live immediately, unless an Author or Editor creates an Edition, which freezes the book's content as it appears at that moment. In a book with at least one Edition, subsequent changes are not visible to the public until a new Edition is published. Please note that while these editorial states apply to media as well as to pages, media files themselves are not versioned—only the metadata for the media. Replacing a media file, even one published as part of an Edition, will update that file immediately in all Editions. If you wish to maintain multiple versions of a media file, we recommend uploading each version as a separate media item. Also please note that making pages and media “hidden” using the trash can icon in the header or via the Dashboard will do so across all editions, even if the page or media was previously published.